NOTE: You will not need to retype your personal comment a second time on the next page because you are writing it above. 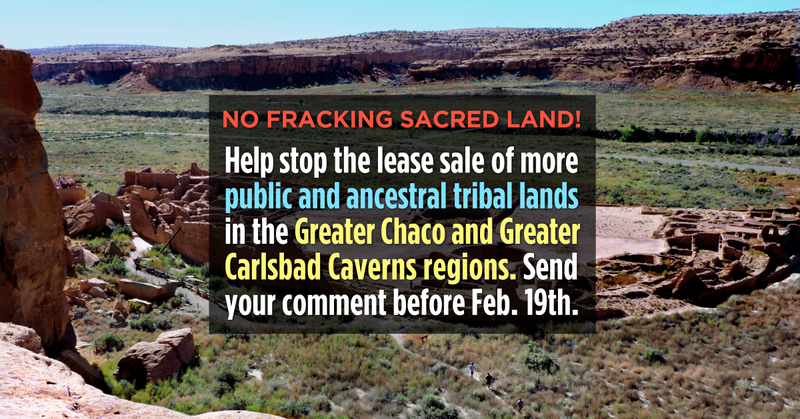 You may receive updates from Frack Off Greater Chaco, the sponsor of this letter campaign. During the 35-day government shutdown, the Bureau of Land Management (BLM) was working behind the scenes to advance the March 2019 lease sale of close to 11,000 acres in New Mexico, including over 10,000 more acres in northwestern New Mexico’s Greater Chaco region. As vital government services came to a grinding halt, which had a direct impact on communities living in the Greater Chaco region, the BLM outrageously catered to the needs of the oil and gas industry. The BLM is allowing the public only 10-days to protest the lease sale of more public and ancestral tribal lands in the Greater Chaco region and in southeast New Mexico’s Greater Carlsbad Caverns region. We have until February 19th to collect and hand-deliver thousands of comments to the BLM state office in Sante Fe. We saw some progress in the fight to protect the Greater Chaco region from more oil and gas development at the March 2018 and December 2018 lease sale, but we need to keep up the pressure and hold the BLM accountable for its shameless, egregious behavior and remind them that they work for all New Mexicans, not just the oil and gas industry. The BLM will not accept letters that are emailed. They must be delivered in person, by snail mail or through an organization who will print and hand deliver. We’ll be printing and hand delivering them to the BLM on February 20th. Personalize this letter. The BLM does not count “form” letters, so please add a personal comment in the space provided. Include the parcel numbers for the land the BLM wants to lease (they are listed in the letter template). Include points of particular relevance when writing your comment letters. Ideas are found HERE. We will print and hand deliver your letters on February 19th.